MK Lapid in the Gaza envelope: Hamas must pay a price Every time a kite crosses the fence, they have to know that it will hurt them. The chairman of the Future Party, MK Yair Lapid, toured the Gaza envelope Thursday and criticized the government of Prime Minister Binyamin Netanyahu. During the tour, Lapid met with Eshkol Regional Council head Gadi Yarkoni and the council's security coordinators. Lapid heard from them about the great complexity of the role of the local security chief. Lapid then went on a work tour with the local security chiefs and went with them to see a fire which had broken out just a few minutes earlier. 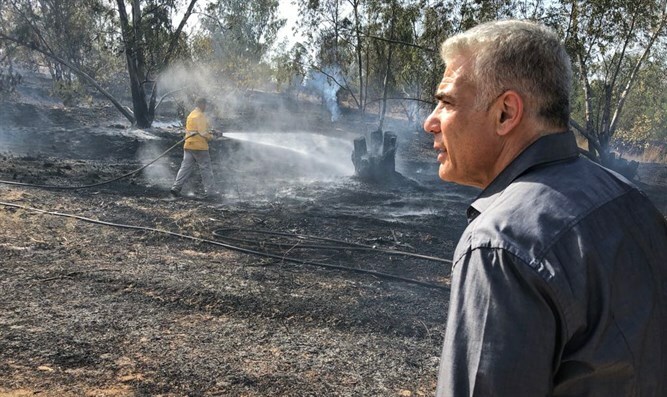 Lapid closely observed the work of the firefighters and KKL-JNF personnel and thanked them for their devotion and hard work. "It is not only the fields that are burning in the fields surrounding the Gaza Strip, but the Israeli deterrent is also burning. Let's ask ourselves what Netanyahu would say if he were in the opposition now, that there is no policy, that there is cowardice," Lapid said. "The government needs to provide a much larger toolbox for the IDF, in order to deal with what is happening here today and at the same time to create a policy vis-à-vis a reformed and orderly Gaza. They are not doing that." "For years, Netanyahu spoke about security this, security that. You cannot raise children when you wake up every morning and you have a fire in the window and you can not go on vacation when parents do not know where their children are. And a government cannot be all day in tweets on Twitter instead of drawing up policies against Gaza and even reaching the point where Hamas leaders, including Yahya Sanwar, are thwarted, in order to stop kite terrorism, because these kites are terrorism," Lapid said. Lapid added that "courageous countries say that Hamas must pay a price, and the kites are terrorism and therefore Hamas has to pay a price every time a kite crosses the fence. They have to know that it will hurt them, in their territory." "Since 2014, I have been talking about international humanitarian aid to Gaza and disarming Gaza, and for the past four years, nothing has been done about it," he said, adding that the fields of residents of the Gaza vicinity are being burned and destroyed. And mortar shells fall on their homes because the Israeli government did nothing."